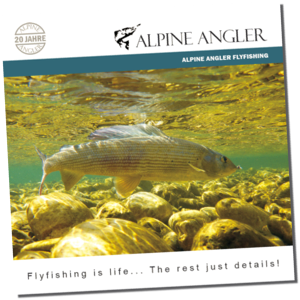 Look forward to the 2019 season with ALPINE ANGLER! The brand new ALPINE ANGLER broschure is here! After time consuming review and edit our new info-broschure is now available. The currently 48 pages strong broschure informs you with many great pictures about our offer in the divisions Fly Fishing School, Guiding, Travel and Apparel. Just request for free! Great season opening at lake Walchen! Last Sunday it was finally time going up to the Walchensee and swing the fly rod again. The weather was sensationally sunny after two cool rainy days and so it was a treat though an intense two-handed rod casting training was the dominant theme. That we still saw silver was the icing on the cake, even if it was an undersized lake trout - a second of similar size was lost. However this is quite a success for fly fishermen on this large alpine lake because no fish days are common. Before long in some places the new fly fishing season is going to start! Real soon now it will be: again at last going fly fishing - yipee! 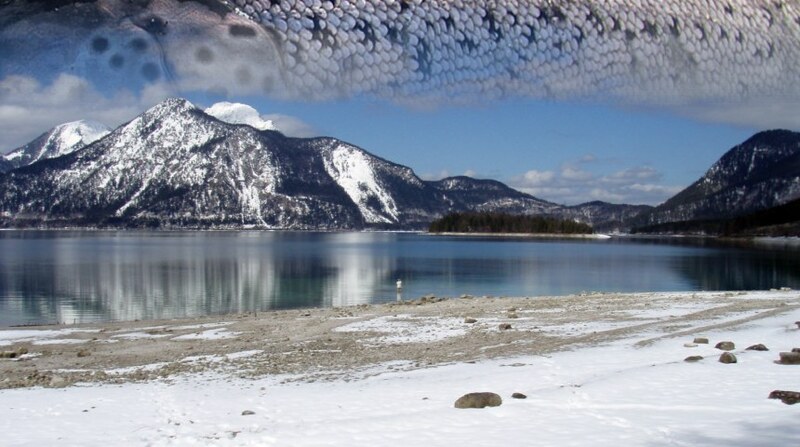 For us the beginning of the new season means: silver hunting - because on March 1. the lake trout will open. To chase this rare quarry there are no more beautiful places here than lake Walchen. Turquoise blue water framed by snow-capped mountains lets one with the fly rod in the hand enjoy the first warming sun rays of the approaching spring. Even catching a lake trout with a fly, let alone a large one (>60cm) is not an easy task in the whole Alpine region and requires a good portion of luck as well, there is at least a real chance still today. And even if no lake queen bites, so the lowered banks of the lake in spring provide an ideal terrain for an extensive casting training in a gorgeous ambience. Treat yourself now in March and April - in these 2 months the lake trout swim near the shore - with a half or full day guiding with integrated casting training coached by Andy Pfirstinger from which you will benefit in any case and be perfectly prepared for the new season (Single hand and/or Double Hand, as it pleases). And with a bit of luck you may catch your first lake trout on a fly. Guide Andy with his 20 years of experience at this beautiful mountain lake has led quite many fly anglers to this success. All travel dates for the season 2019 are online! We have good and bad news: The bad news is, most trips are already booked solid - repeat participating customers have priority. We feel sorry for all other prospects but we hope you'll understand our policy. The revolutionary ASQUITH Flyrods from G.LOOMIS with Spiral-X Technology! Here you can learn more about the ASQUITH Single Hand rods and ASQUITH SPEY Double Hand rods! PS: Although these high-end fly rods are not cheap we are offering them to you at very reasonable prices already including sales tax, custom duties and freight. Only downer, many models might have a long time of delivery but some models in limited numbers we have in stock by now! Therefore don't wait and grab yourself one of these dream rods. Check your desired model online in our web-shop concerning delivery time or contact us about your desired model. 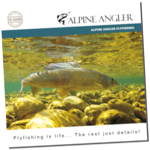 Request the ALPINE ANGLER info brochure for free! The now 48 pages strong brochure informs you about our offer in the divisions Fly Fishing School, Guiding, Travel and Apparel. Simply send an email, post card or call us.